Same authentic paneer. Suitable for vegetarians. 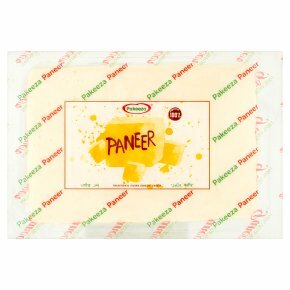 Everest Paneer is a unique flavour carrying cheese. Stir fry cubes or slices of Paneer and add into your favourite curry. Marinade in sweet chilli and flash grill or BBQ for an authentic char grilled taste. Season to taste, grill and toss into a warm salad or add to roasted vegetables to make a delicious wrap. Heat and eat, its so versatile. Suitable for vegetarians.Everest Paneer is a unique flavour carrying cheese. Stir fry cubes or slices of Paneer and add into your favourite curry. Marinade in sweet chilli and flash grill or BBQ for an authentic char grilled taste. Season to taste, grill and toss into a warm salad or add to roasted vegetables to make a delicious wrap. Heat and eat, its so versatile.